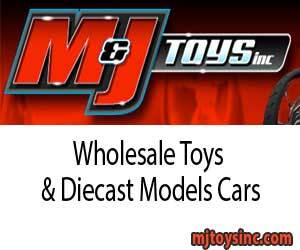 Toys and Diecast Models Cars are specialty of MJ Toys Inc. Wide selection of diecast model cars are wherehoused in our location from all major manufacture diecast model car manufacturers including Maisto, Burago, Jada Toys, New Ray, Hotwheels, Greenlight, Kyosho, Auto Art, Greenlight, Norev, Highway 61, Minichamps, Motor Max, Mondo Motors, Auto World, ERTL, M2 Machines, Sun Star, Sunny Side, Welly, BBR Models, Biante, Boley, Case IH, CSM Models, Daron, First Gear, Gear Box, GMP, Guiloy, Jadi, Johnny Lightning, Kinsmart, Liberty Classics, Luxury Diecast, Motor City Classics, Motor Head Miniatures, Muscle Machines, Norscot, Phoenix Mint, Revell, Road Signatures, Schuco, Shelby Collectibles, and Signature Models. Each manufacturer makes certain types of vehicles. We carry Ferrari, Lamborghini, Pagani, Bugatti, Ford, Chevrolet, Dodge, Aston Martin, Audi, Bentley, BMW, Buick, Cadillac, Chrysler, DeLorean, Ducati, Fiat, GMC, Harley Davidson, Honda, Hummer, Hyundai, Infiniti, Jaguar, Jeep, John Deere, Kawasaki, Kenworth, Koenigsegg, KTM, Lancia, Land Rover, Lexus, Lincoln, Lotus, Maserati, Maybach, Mazda, Mercedes-Benz, Mercury, Mini, Morris Minor, Nissan, Oldsmobile, Opel, Packard, Peterbilt, Peugeot, Plymouth, Pontiac, Porsche, Renault, Rolls Royce, Saleen, Saturn, Scion, and Shelby. These diecast collectable cars come in many sizes or scales. The different scales we have for diecast cars are 1:12, 1:18, 1:24, 1:32, 1:43, 1:64 and 1:87.